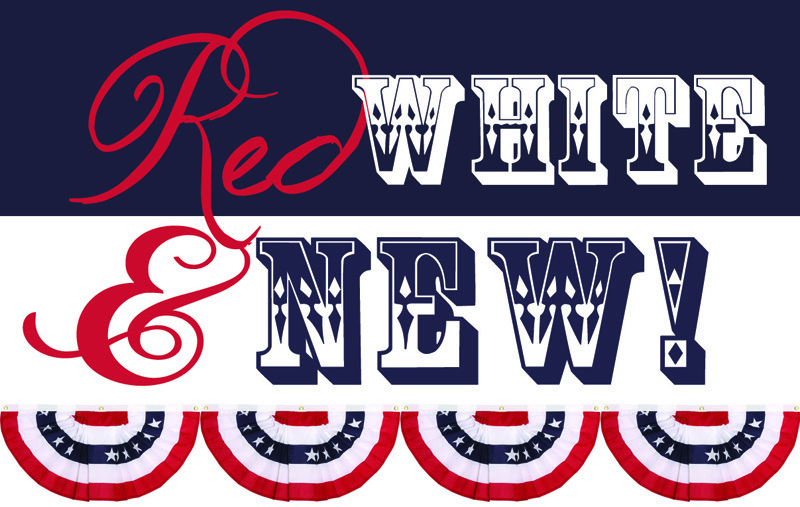 The Fourth of July is the perfect holiday for outdoor entertaining and relaxing, and the J Banks Retail Store has just received several new items that would make great additions to anyone’s Independence Day Soiree! These new outdoor pillows are perfectly patriotic! 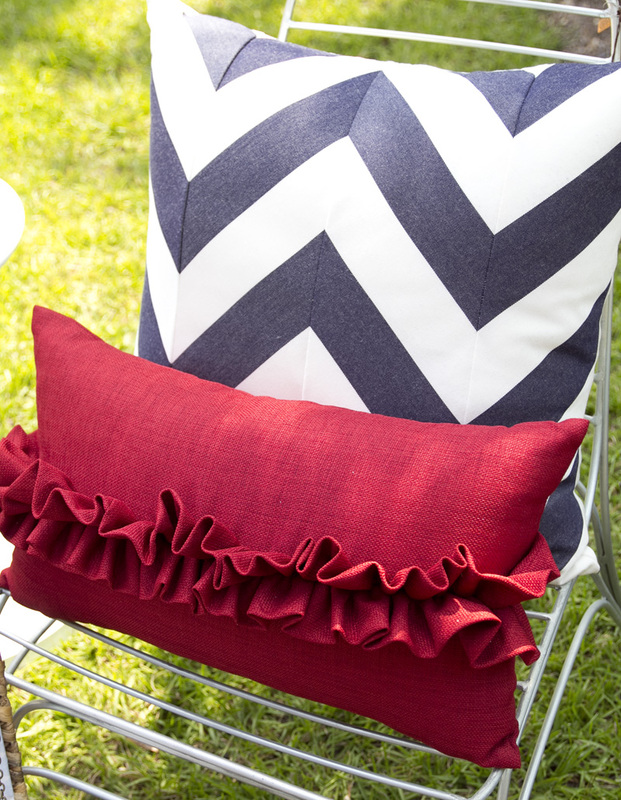 This graphic navy and white chevron pillow pairs nicely with this red one with a horizontal ruffle. 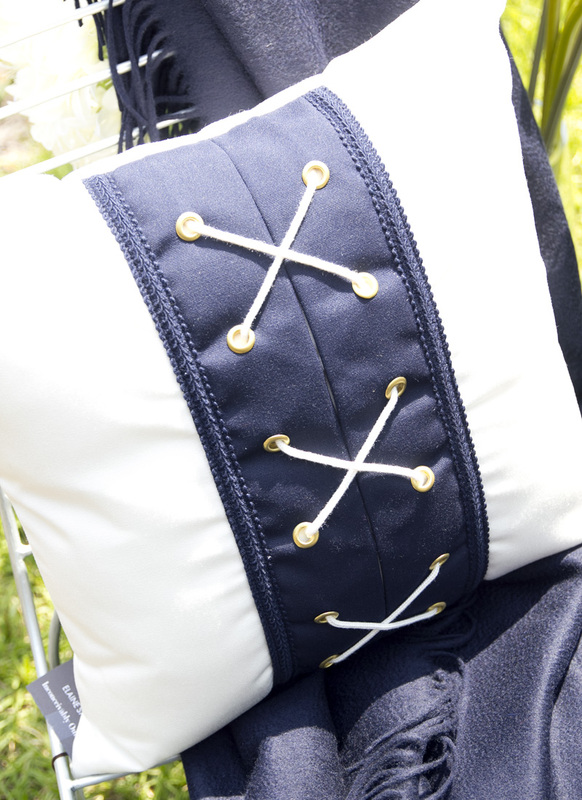 We love the nautical rope and grommet detail on this pillow. 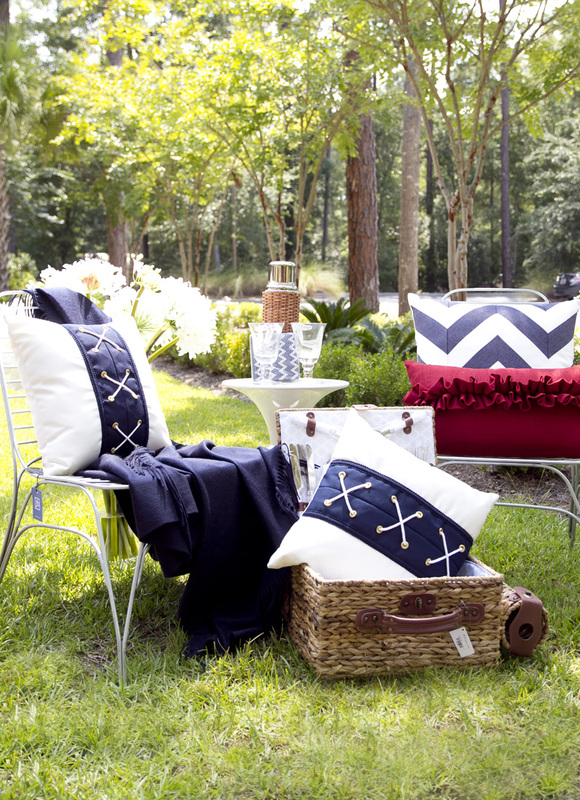 Wow – We can’t believe these are outdoor pillows! We have a great selection of customizable trays, buckets and bins. 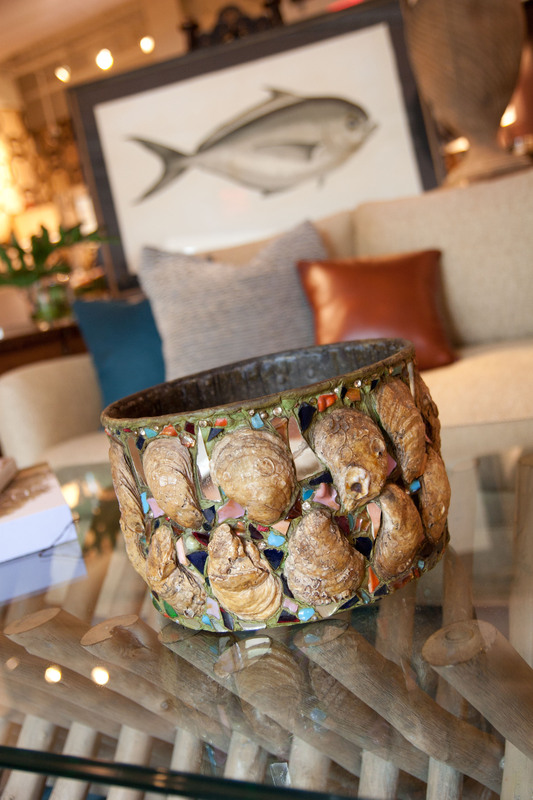 This “Cocktails” tray would be great beach or poolside! 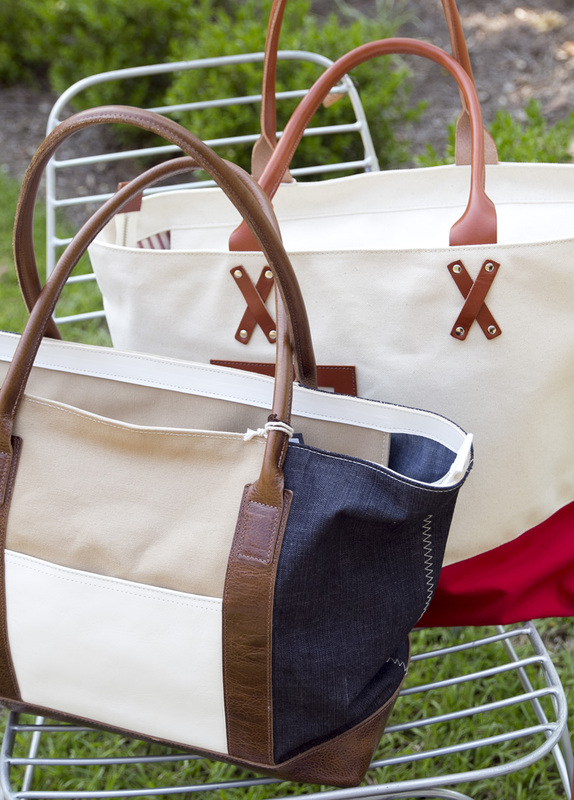 Our new Graf & Lantz tote bags come in a variety of color combinations. 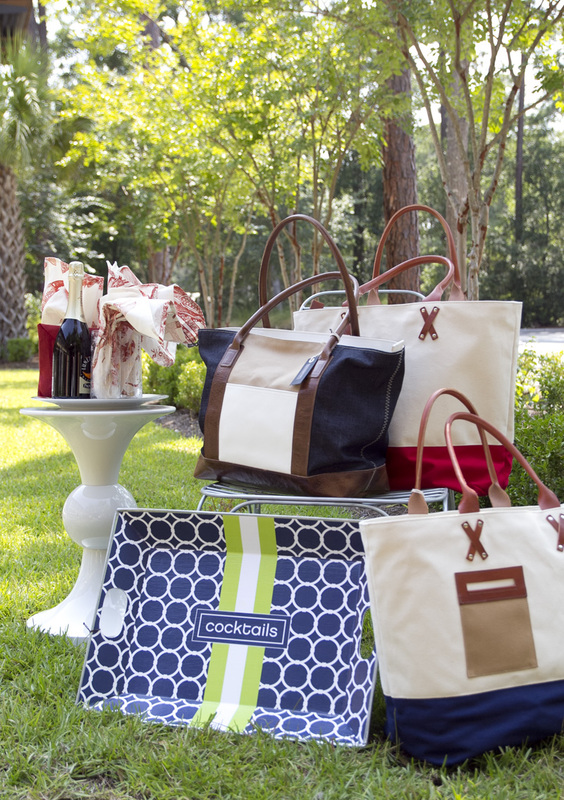 With leather straps and details they are chic, durable and most importantly – functional! 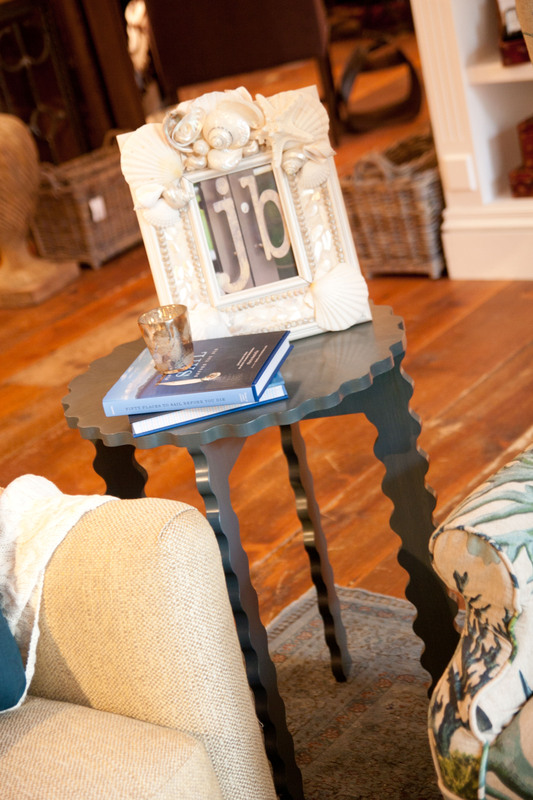 This white side table is perfect for a porch or patio. Topped with glasses, red linen coasters and nautical print napkins it is the ideal place to set down your iced beverage or cocktail. 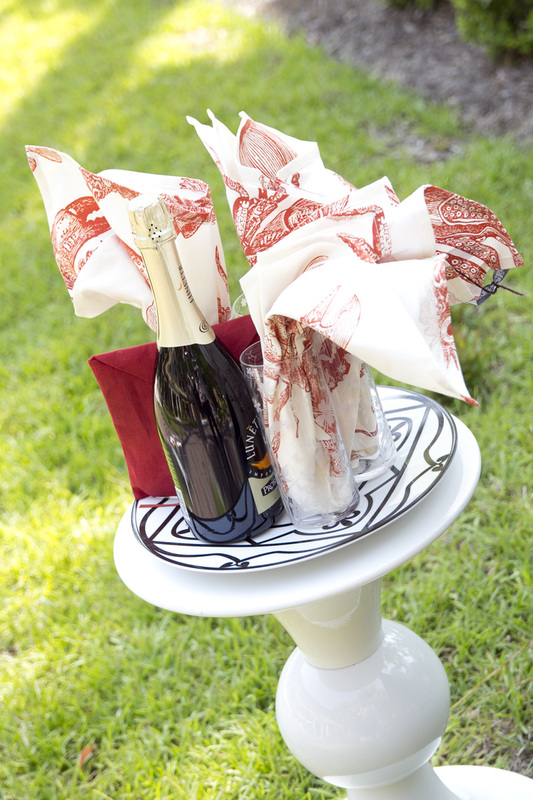 New rope napkin rings look great with nautical inspired red, white and blue place settings. 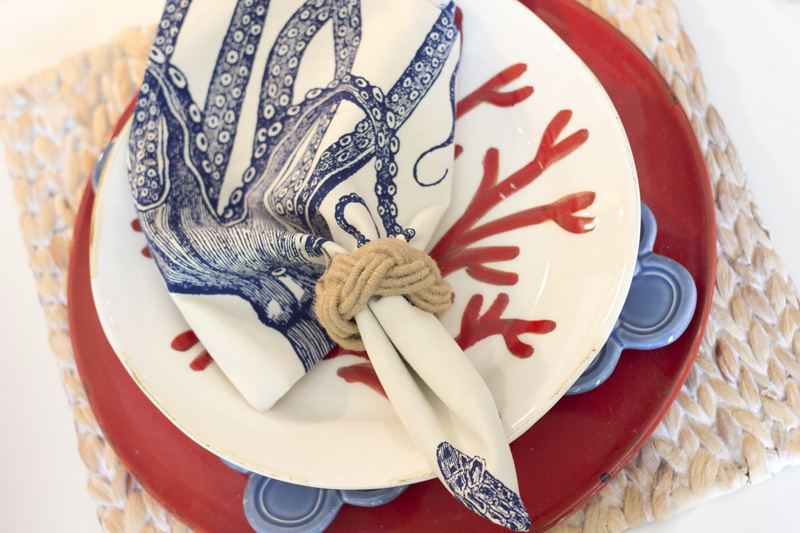 These hand painted plates come adorned with red coral, lobsters and crabs! For more information or to order any of these items please call our Retail Store at 843-682-1745. JB: What can you tell us about your color choices? 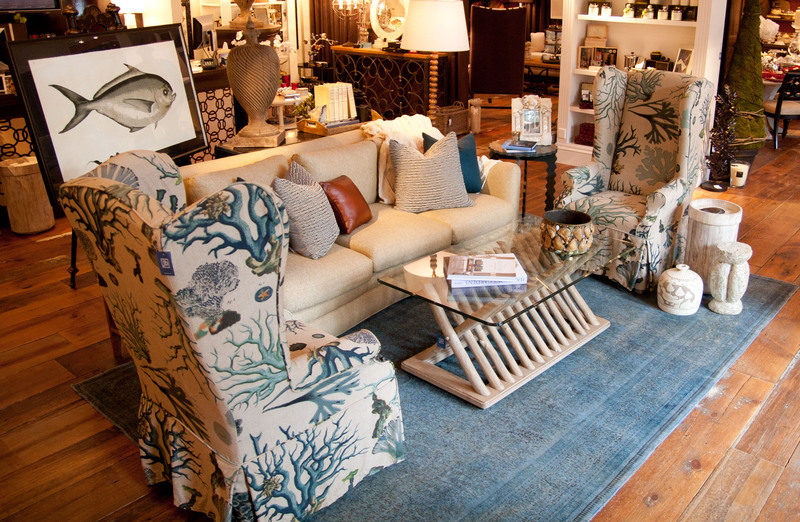 Lisa: I’m really into the deep blue-green color seen in the pillows and the rug. I like deeper, richer colors like this, brightened by a contrasting color. 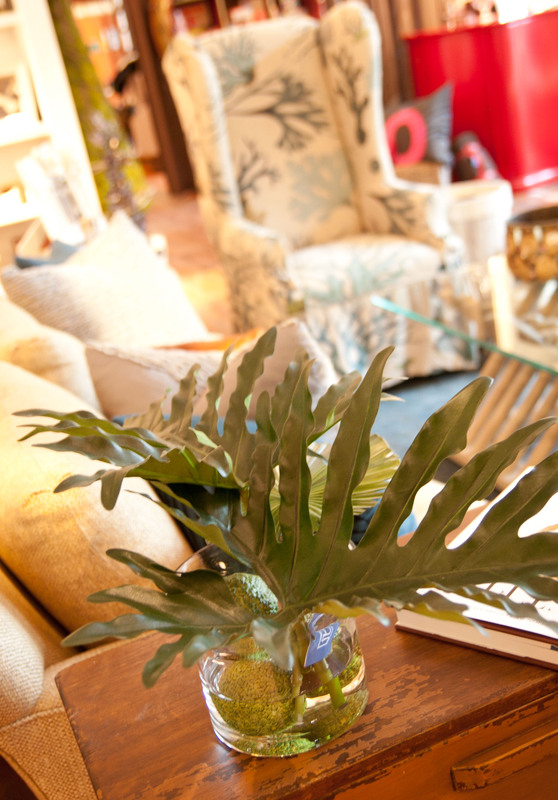 In this case the brightness of the green in the leaves of the fiddle fig tree and the red and orange accents. 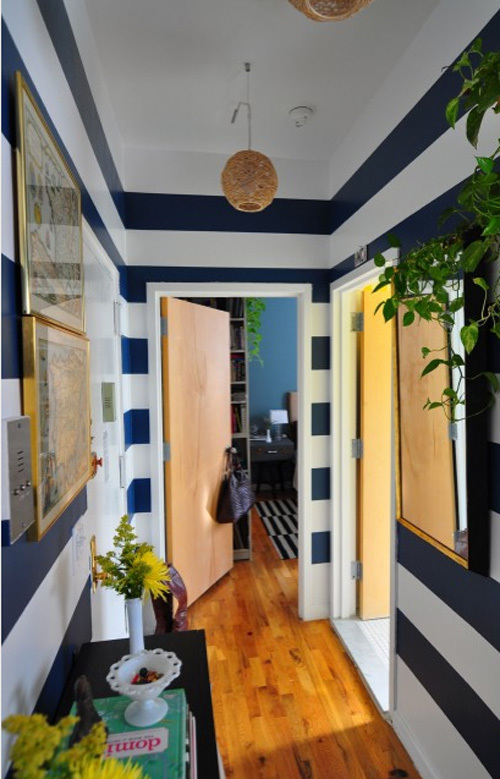 Using contrasting or accent colors sparingly tends to make a bigger visual impact. 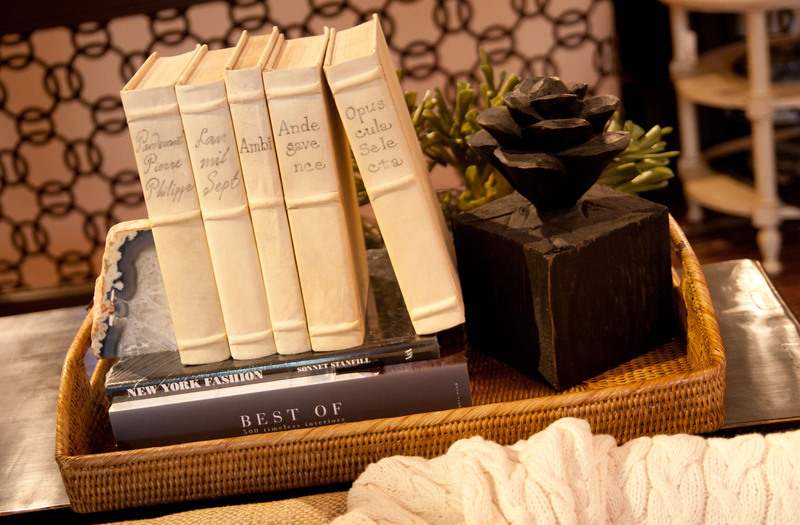 JB: What is your favorite item and/or items in the vignette? Why? 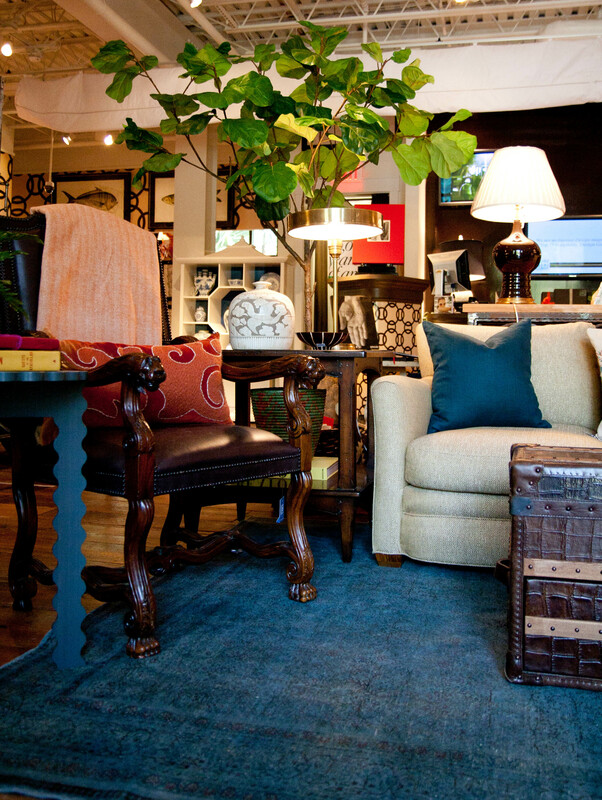 Lisa: I knew I really wanted to use the tree, the antique rubbed brass lamp (the one by the tree) and the trunk. 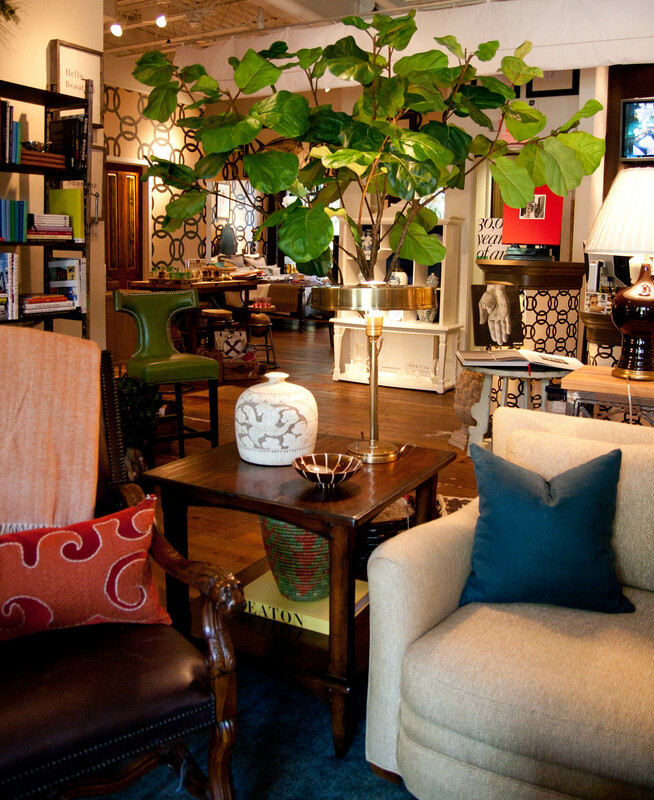 I love the shape of the leaves of the tree and what the height does for the space. 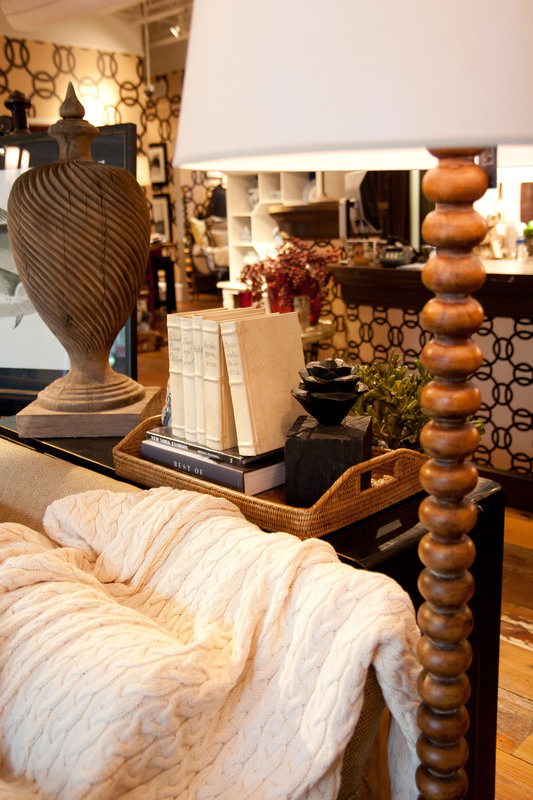 I really liked the finish and style of the lamp. 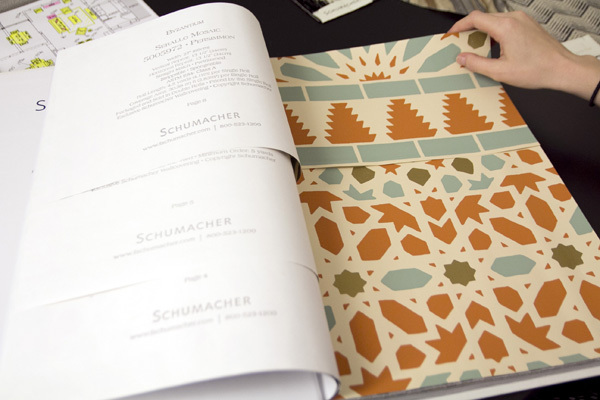 The style isn’t typical, and the finish works well with the other selections as it isn’t too harsh, and gives a softer look. 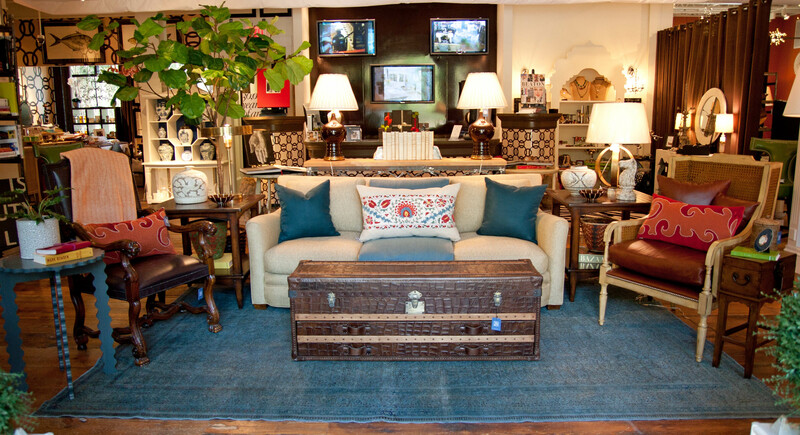 I loved the trunk when I first saw it…it reminds me of travel and using unexpected items, for traditional pieces in a room. 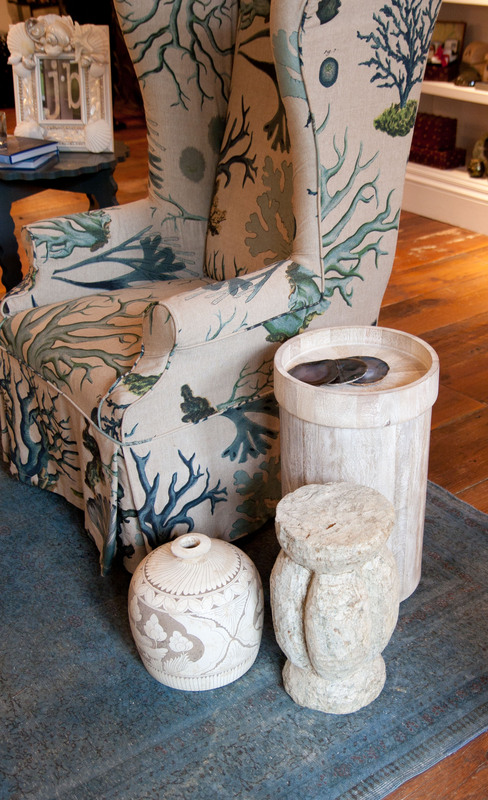 All of the other selections were chosen around these three items but it all feels like it evolved over time. 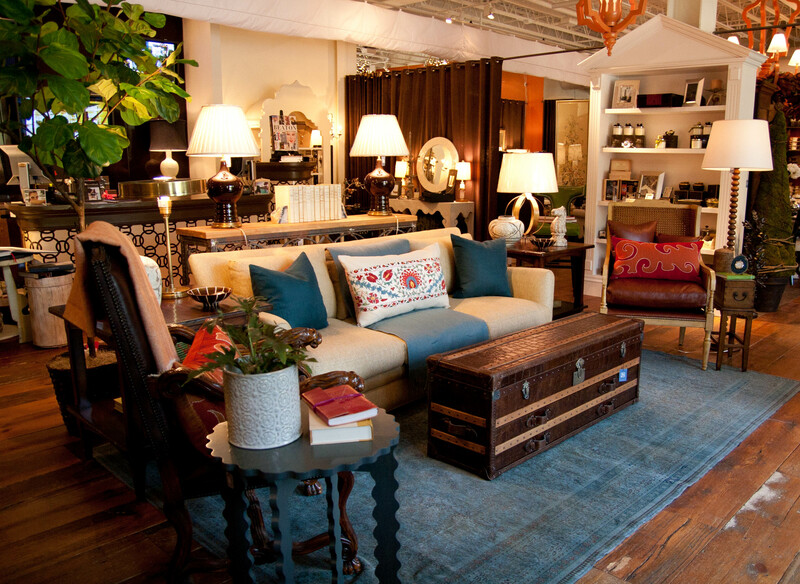 JB: What do you consider when making lighting selections for a space? Lisa: I think it’s important to use several different kinds of light in a space. The brown ceramic lamps on the console give general lighting. 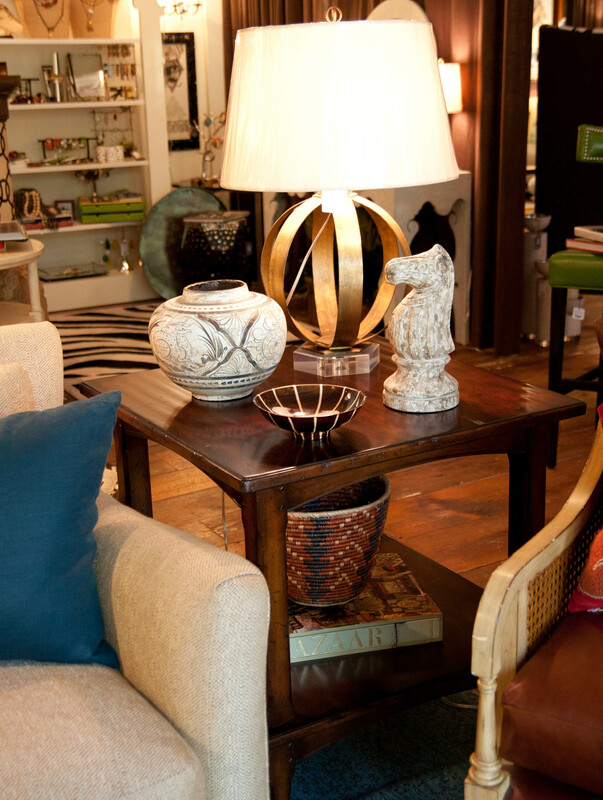 The lamps on the side table act as another level of general or ambient lighting. 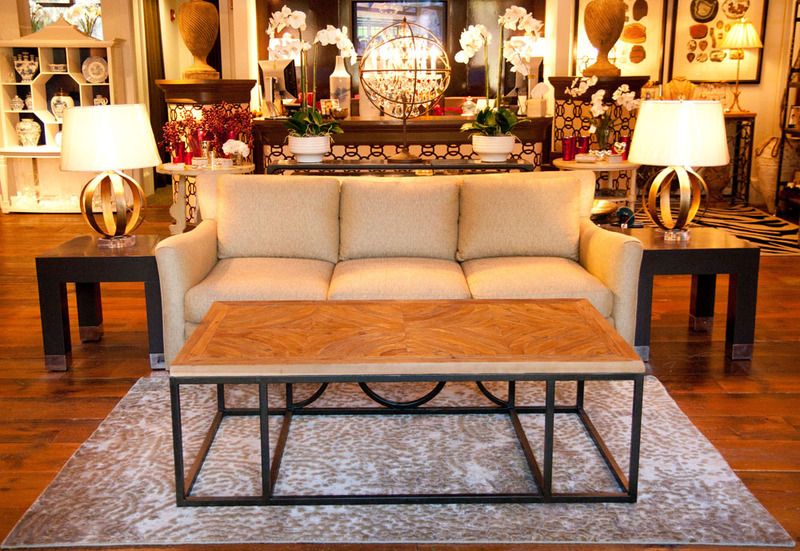 They can also act as accent lighting as they are highlighting the pieces on the side tables. 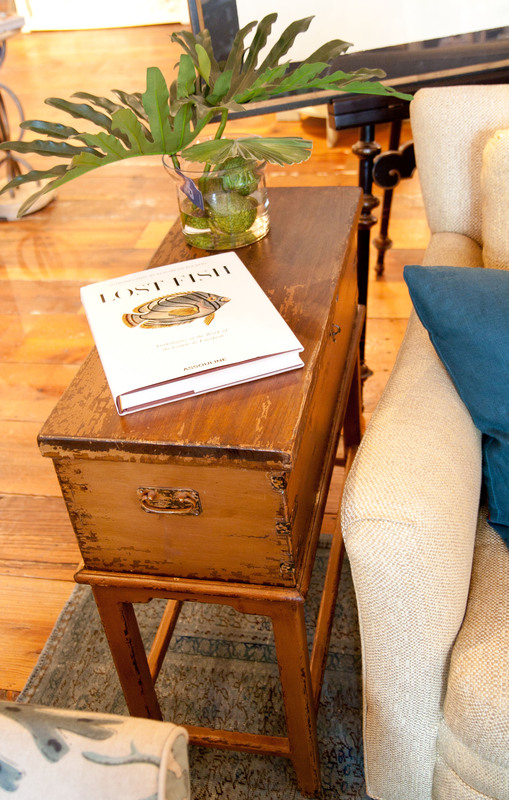 The floor lamp acts as task lighting for reading in this chair, but also helps balance the height of the tree. 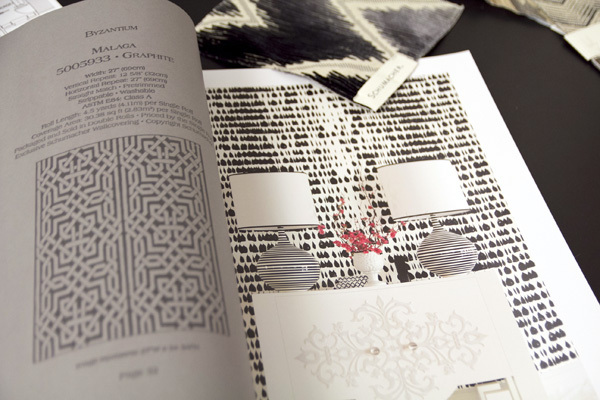 The scale of each is important as it helps balance the other elements in the space. 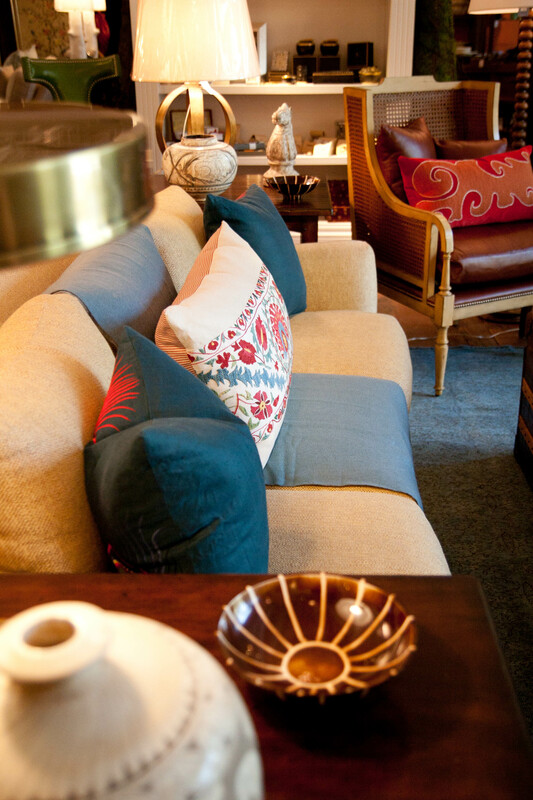 The finishes on all of the lamps used are rich, but not too harsh. I think choosing anything in a nickel finish would have given this space a completely different feel creating more energy instead of the calmer, cozy feel that I wanted to achieve. 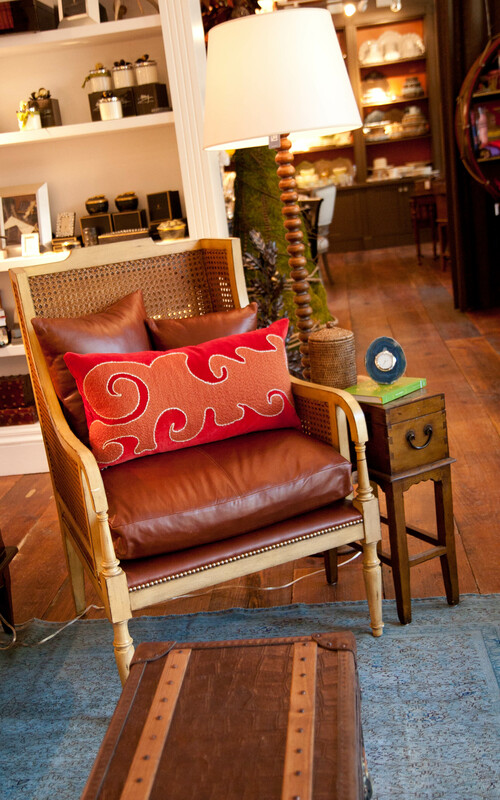 How fabulous is this velvet and mohair pillow from the J Banks Collection? 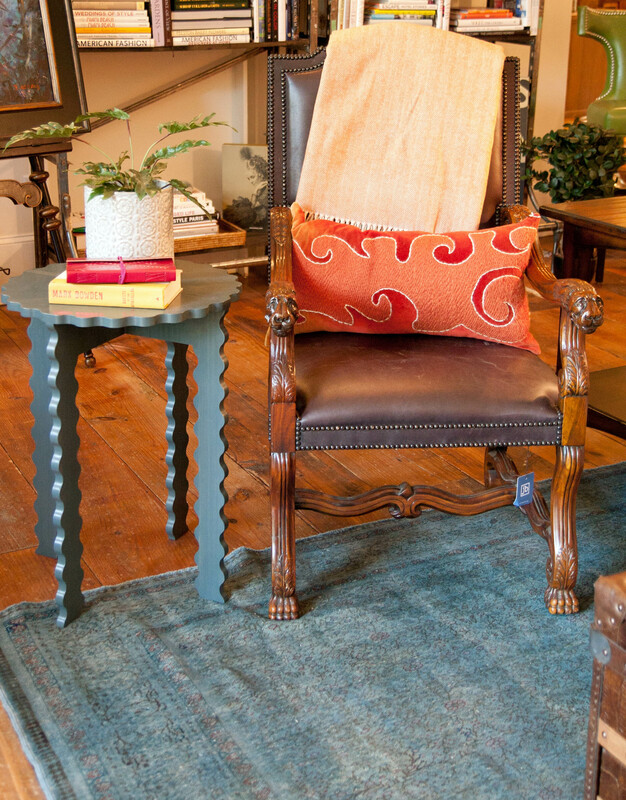 We think it looks great the way that Lisa paired it with the cane back chair. 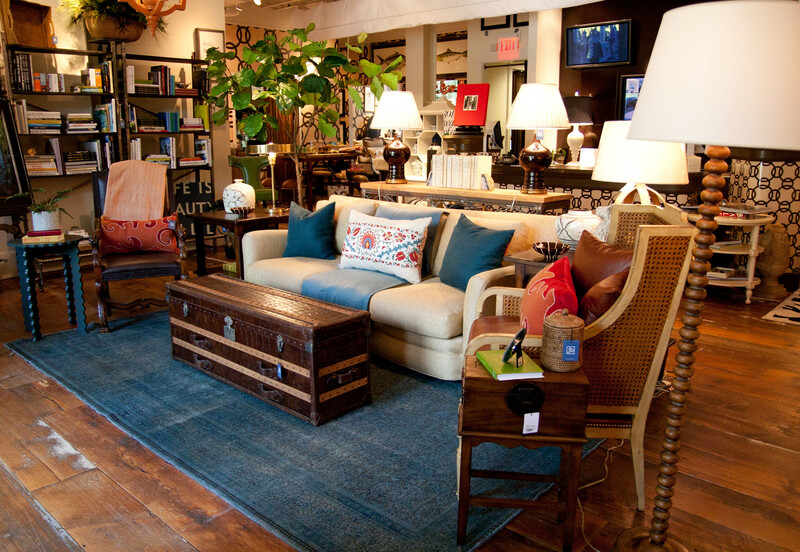 JB: What advice do you give your clients when selecting and placing accessories into a space? 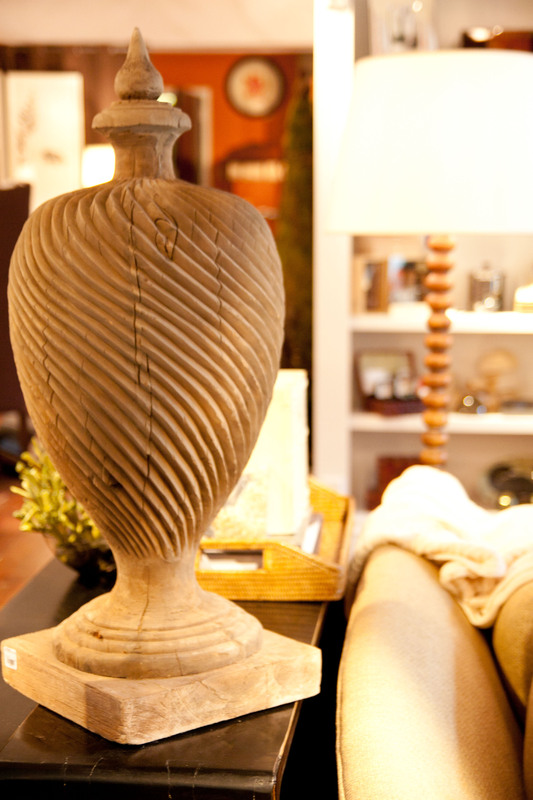 Lisa: I always suggest to use things that you love in your space. 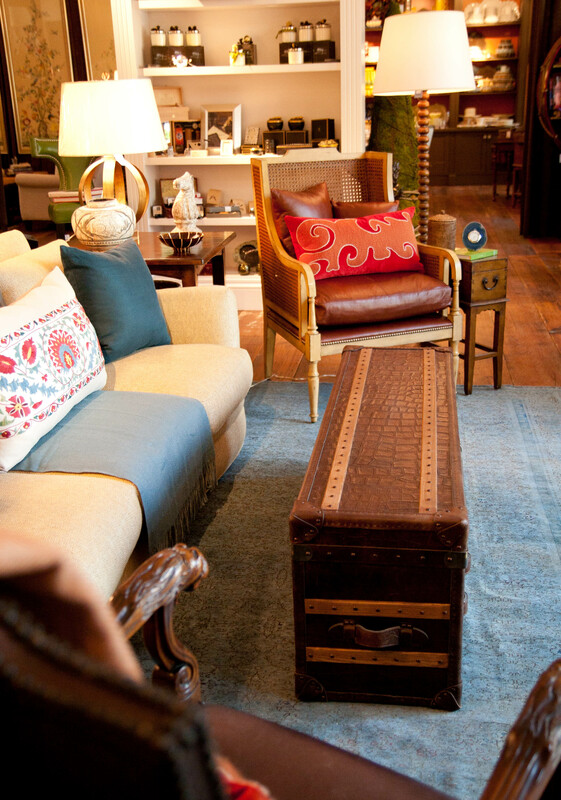 I envision the person living in this space as someone who is an avid traveler and has brought back treasures from their journeys. Each piece tells a different story of a different trip that was taken. 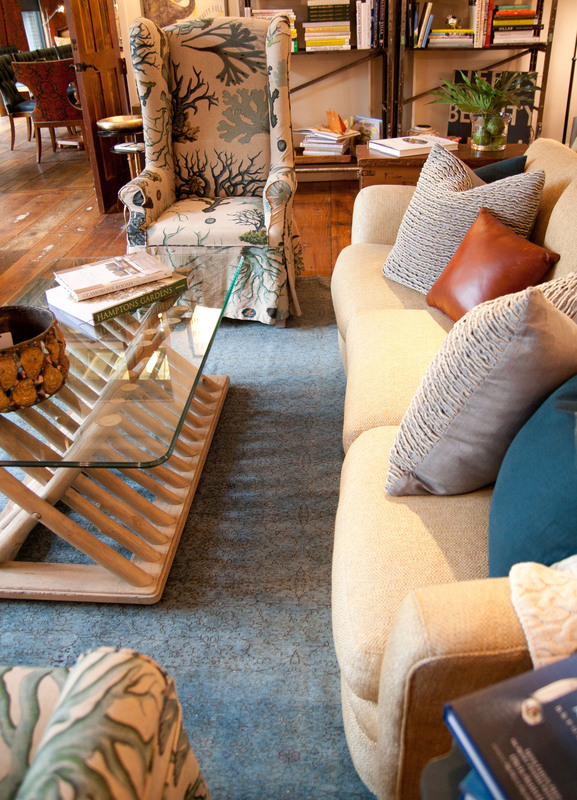 Let your space reflect you and what you enjoy. Cocktail tables don’t always have to be traditional. 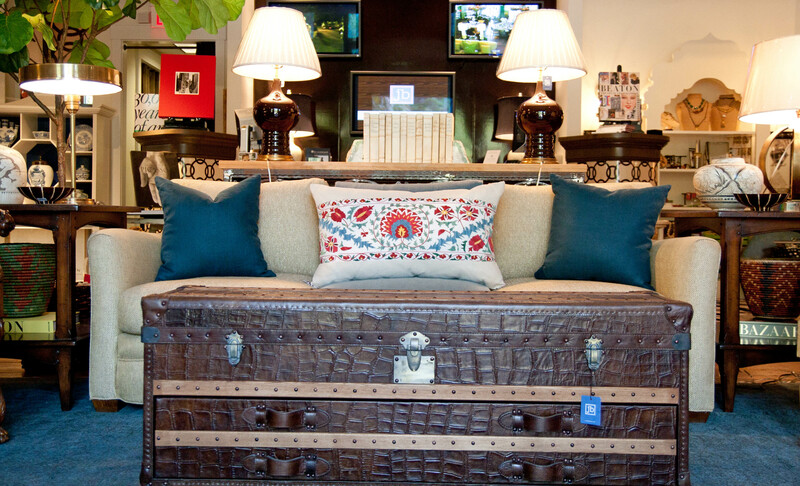 Lisa cleverly chose to use this trunk which is a great idea because you could also use the piece for added storage. 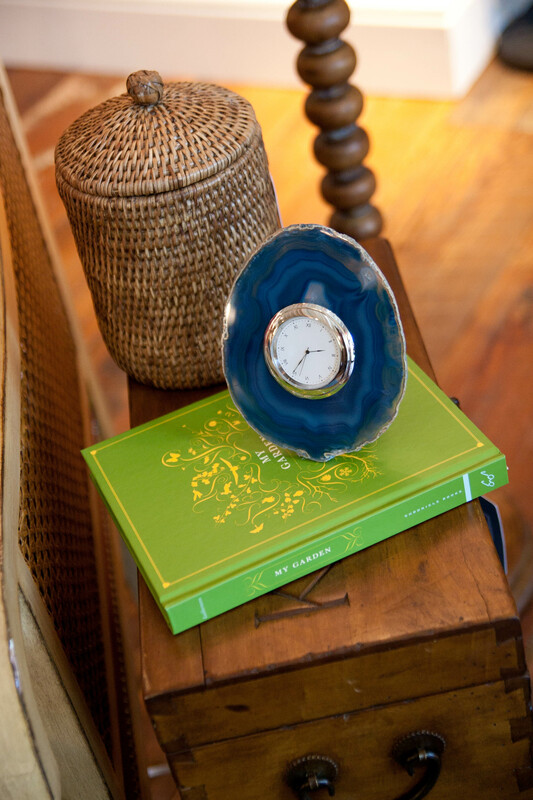 Our retail buyers love this agate clock by Rablabs. 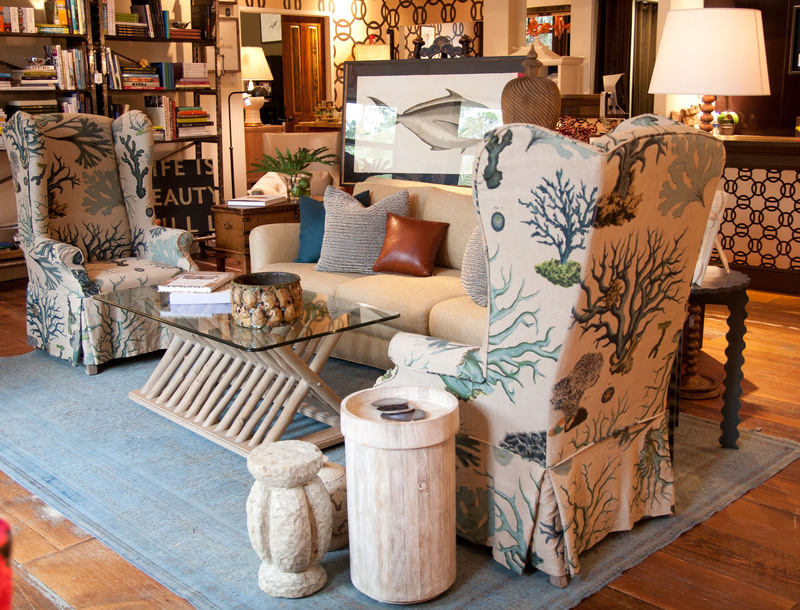 Keep following our blog to see more designer interpretations and check out our previous white sofa designs by Deb Van Plew, Hannah Fulton ,Cindy Munn , Adrienne Warner, Shelley Wilkins, Patche Pratt and Janet Perry. 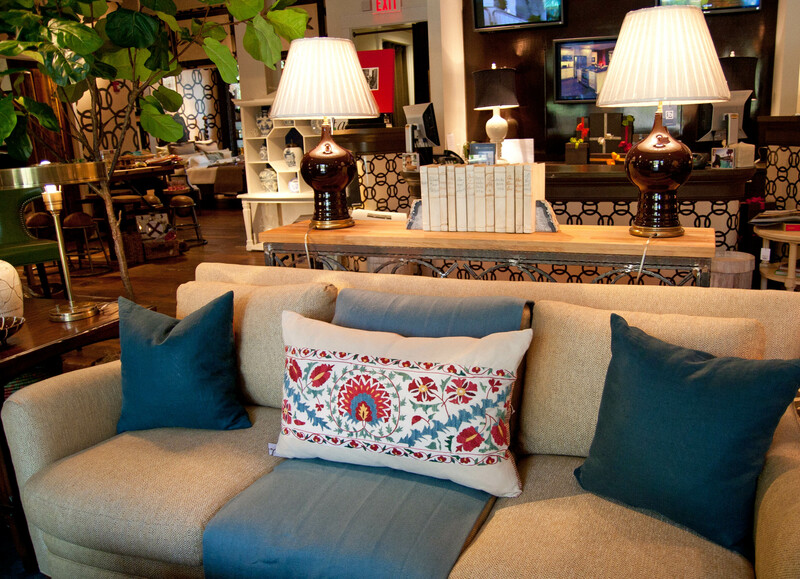 We saw these great pillows at the Americasmart in January! 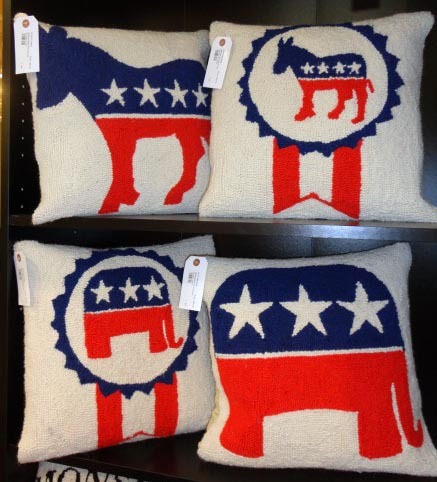 These political logos would stir up lively conversations in any home! If you’re having a local election today, remember to get out and vote! 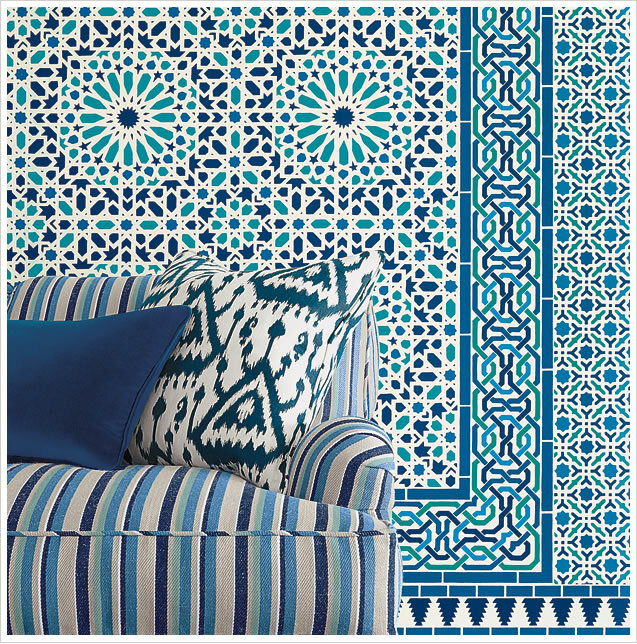 From jewelry to wallcoverings…blue is here to stay! These room settings are different styles but blue is the constant. 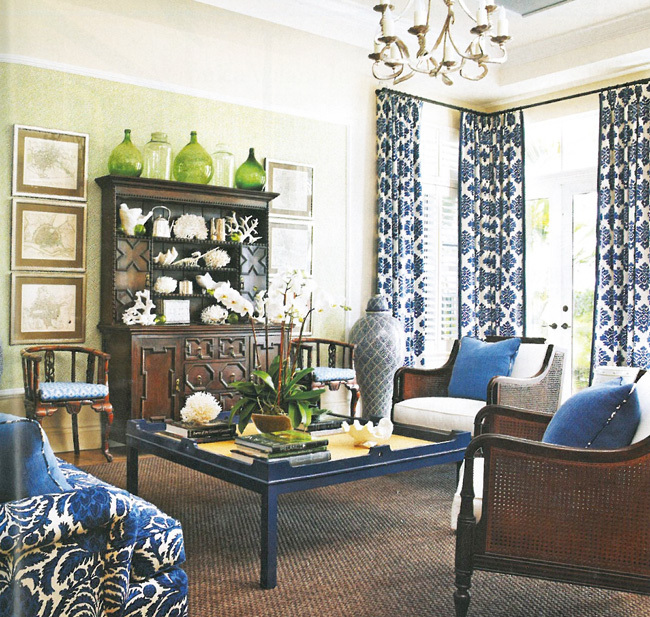 This is a great traditional room with antiques, blue fabrics and a blue cocktail table. 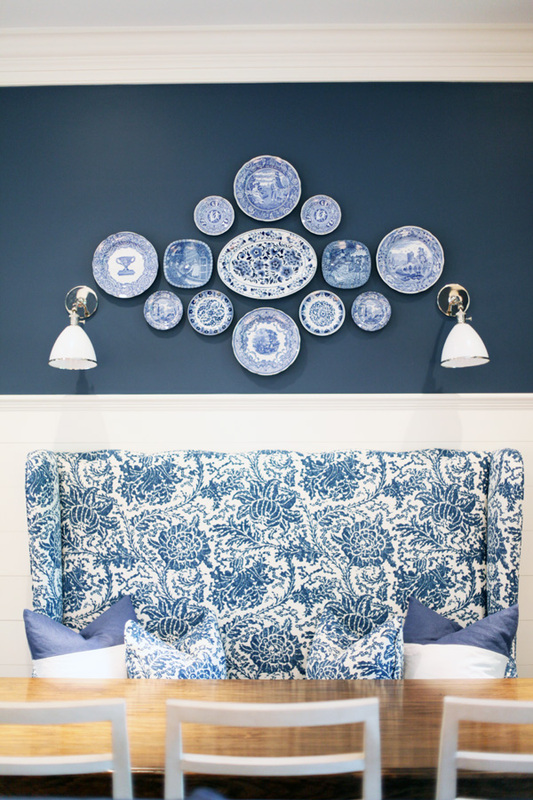 You can use blue in paints, lamps, china, porcelain and even tile. 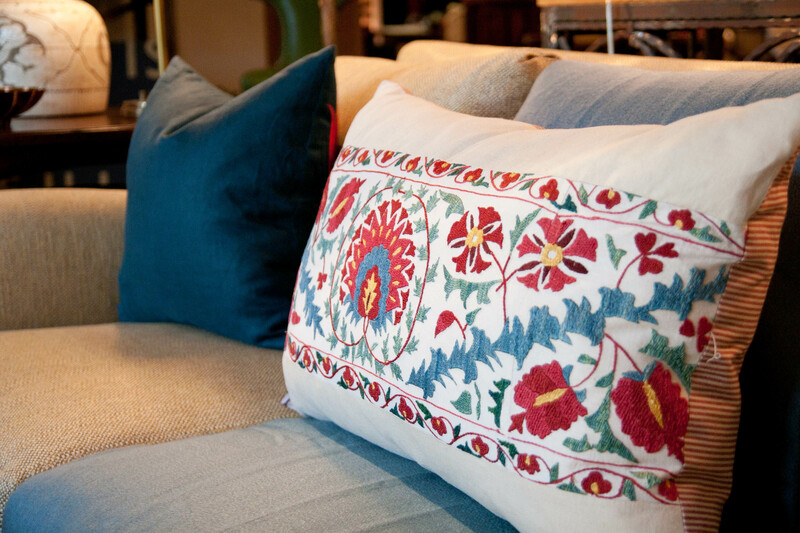 Blue does not always have to be used in fabrics. All greens with blue and white porcelain – Fabulous! 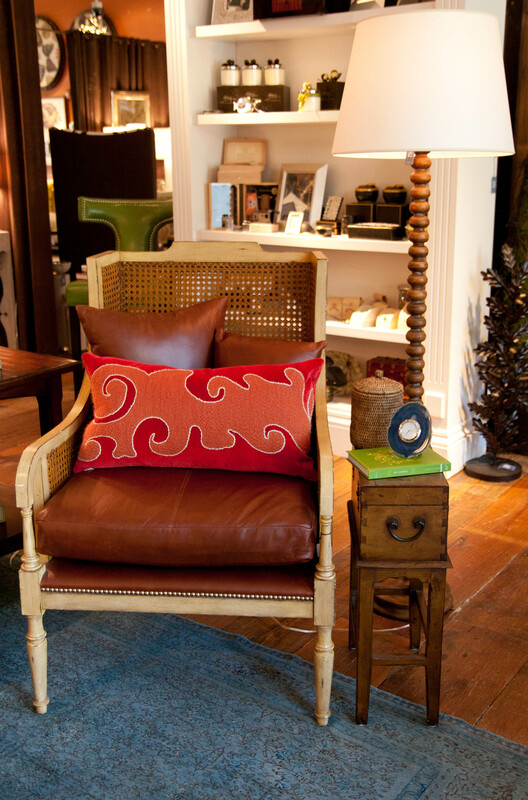 I love the stripes on these great new lamps from Ralph Lauren. 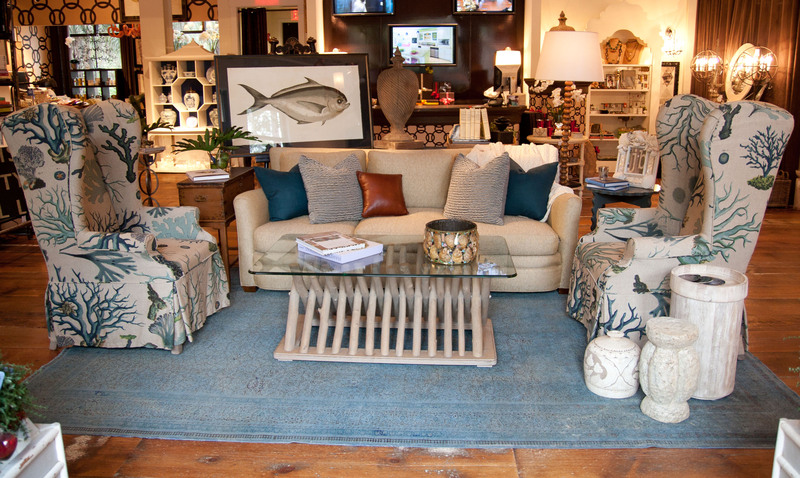 This is one of my favorite pieces on the J Banks Retail floor in of course, blue and white! 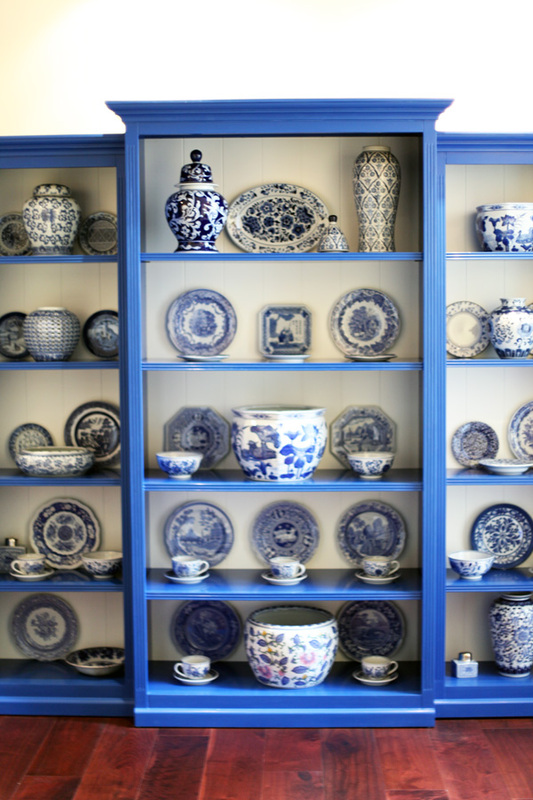 This was a project that I worked on where the client had an existing assortment of different blue and white porcelain that we grouped as a collection above seating in the breakfast room. 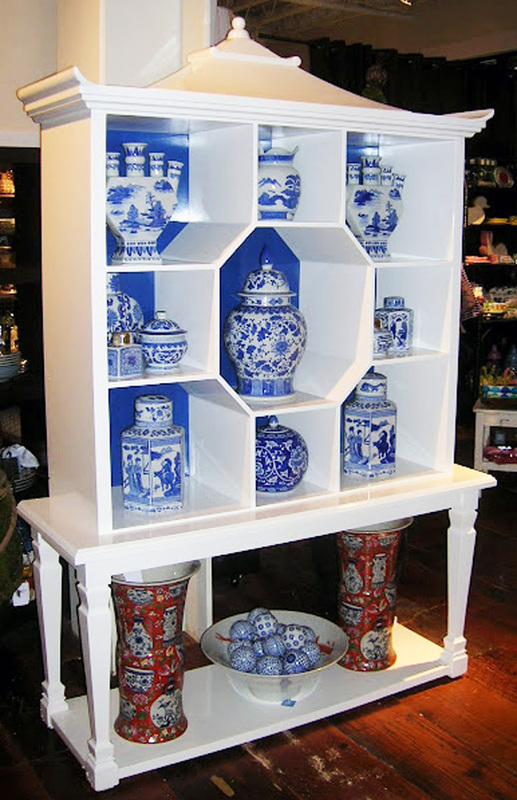 This piece of furniture was originally painted black and I transformed it with blue and white lacquer paint so that it became the perfect place to display her collection as well. As you can see, blue is easy and versatile. Truly tried and true – good ole blue!